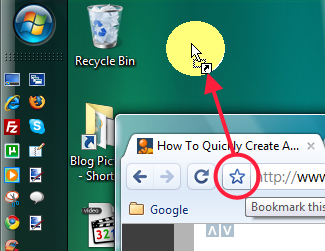 Drag and drop the bookmark icon on the left of the address bar on your desktop. The shortcut will be created. but it leaves a chrome icon on your desktop not the icon of the website eg blogger icon. How to get that?? It does work in Chrome for MAC – just figured out how…. You save the shortcut in one of your bookmarks folder. Then open the bookmarks folder and drag and drop to the desktop from there! This does not work in the mac version of Chrome. This is handy, but…The shortcuts I made opened in IE (my default browser). Easiest way…. Drag and drop – Done. Another way in chrome is by creating application shortcuts ,we can create shortcut to the website.Open Google Chrome click Control Page Menu> create Application Shortcuts.